Should I buy winter tyres? No one wants to spend more money than they have to, so it’s understandable that you might question the value of paying more for separate winter and summer tyres. The fact is, deciding whether or not to buy winter tyres comes down to a number of things – and some are simply out of your hands. For example, location – which country or what terrain are you driving in? In some European countries winter tyres are mandatory. In others, they’re recommended. While in some countries, like the UK, the majority of drivers use summer or all-season tyres all year round. Cost of swapping with summer tyres. Assuming that you’re driving somewhere where they are not compulsory, you need to weigh up the pros and cons before asking yourself ‘should I buy winter tyres’? Winter tyres give you optimal handling in cold temperatures (below +7 degrees C). They offer the best possible grip on snow and slush. 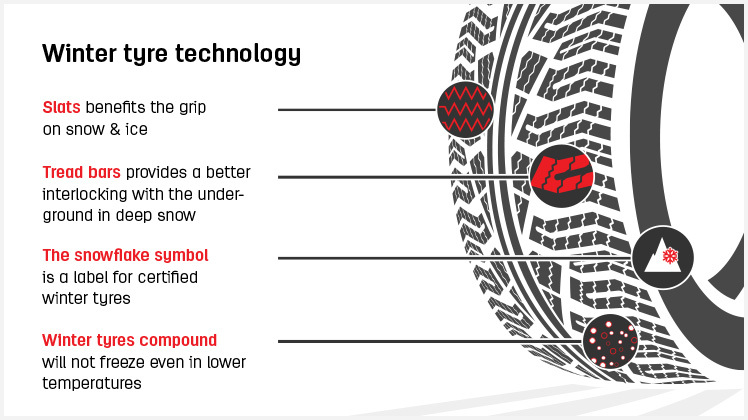 Their braking capabilities on cold roads are superior to summer or all-weather tyres. A car travelling at 31mph will take 62 metres (203ft) to stop on snow using summer tyres, 42 metres (138ft) using all-season tyres, but just 31 metres (102ft) when fitted with winter tyres. Due to their increased natural rubber content, they remain flexible in the cold whereas summer tyres are specialist for milder temperatures. They will keep you mobile if you live in a remote area where snow and ice are common occurences in the colder months. If you drive up and down hills you will certainly benefit from the additional grip winter tyres provide on snow and ice. Winter tyres cannot be used all year round – they under perform in temperatures over +7 degrees C and the wear rates could increase if used in warmer temperatures, due to a special compound mix. Committing to separate sets of summer and winter tyres (including spares) can be expensive. Not only is there the cost of two sets of tyres, including spares, but you may decide to have two separate sets of wheels too to save time and make switching over easier. Plus there is the potential costs of storage if you’re not able to store them yourself, and the garage expenses of having them swapped over every six months. Some insurers consider fitting winter tyres to be a modification and therefore charge a premium. It is important to check with your insurer before you change your tyres. If you’re driving somewhere where winter tyres are mandatory, you obviously have no choice about whether or not to buy winter tyres. Similarly, if winter tyres are recommended, it makes sense to evaluate the cost versus the benefits of improved grip and safer driving in the conditions in which you’re likely to drive. In countries where winter tyres are not compulsory, the decision often comes down to individual lifestyles and locations. For example, in Scotland, where temperatures are often cold and icy, there has been a recent increase in drivers buying winter tyres.